W.L. WYLLIE R.A.- DVDs & CD. W.L. Wyllie R.A., H.M.S. Victory & the Panorama of the Battle of Trafalgar. H.M.S. Victory & The Panorama of the Battle of Trafalgar. Nominated for The Maritime Foundation’s Film and Documentary Award, 2006. To recognise those who have made films or documentaries that have made ‘the most significant contribution in raising public awareness of the United Kingdom’s maritime affairs’. W.L. Wyllie (1851-1931) was one of the most respected and prolific Marine Artists of his period. He was a major player among the bodies responsible for bringing H.M.S. Victory into dry-dock. To help with her restoration fund he painted in his 79th year, the 42'x12' Panorama of the Battle of Trafalgar', on display at the Royal Naval Museum in Portsmouth. 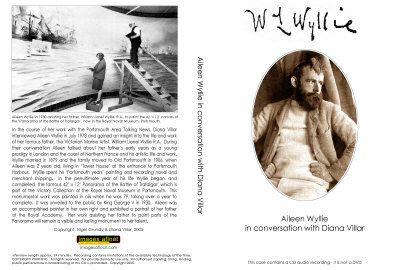 This DVD, produced by Nigel Grundy in association with the Royal Naval Museum at Portsmouth, chronicles Wyllie's life, his arrival in Portsmouth in 1906, the docking of H.M.S. 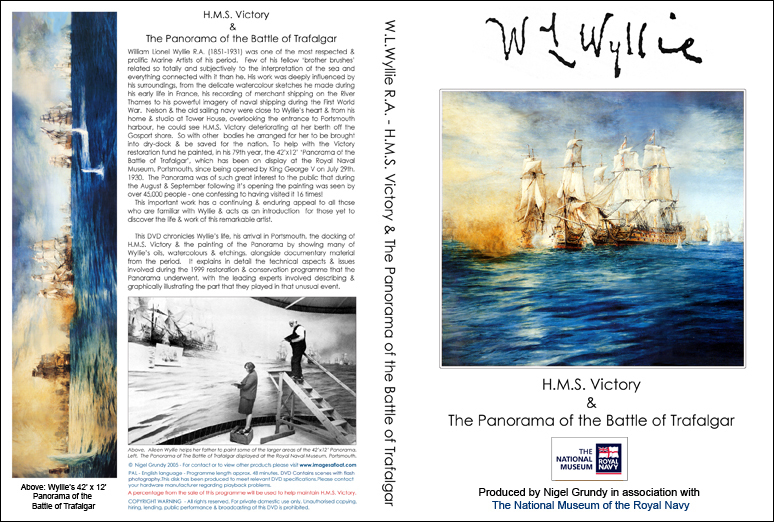 Victory & the painting of the Panorama, by showing many of Wyllie's oils, watercolours & etchings, alongside documentary material from the period. The programme also explains in detail the technical aspects and issues involved during the 1999 restoration and conservation programme that the Panorama underwent, with the leading experts involved describing and graphically illustrating the part that they played in that unusual event. W.L. 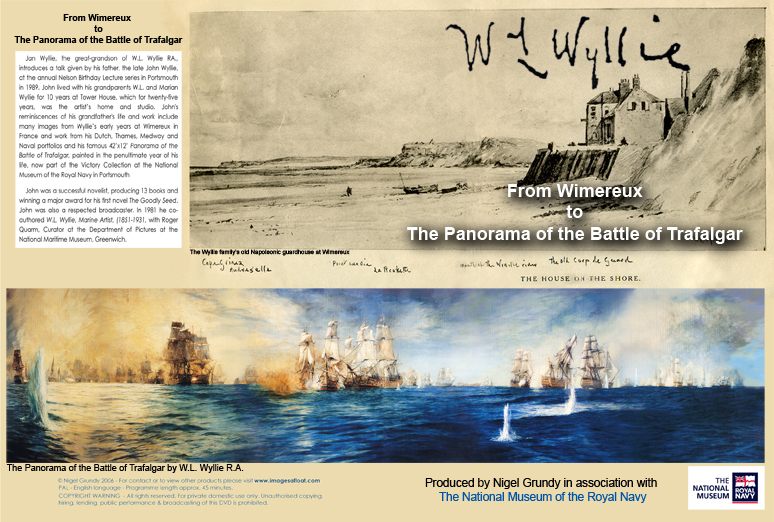 Wyllie R.A., From Wimereux to the Panorama of the Battle of Trafafalgar. From Wimereux to the Panorama of the Battle of Trafalgar. In this DVD produced by Nigel Grundy, Jan Wyllie, the great-grandson of W.L. Wyllie R.A. introduces a talk given by his late father, John Wyllie, at the annual 'Nelson Birthday Lecture' series in Portsmouth in 1989. On the DVD John talks about his grandfather's life and work and shows over 125 pictures of Wyllie's oils, watercolours and etchings. When a child John had lived with the Wyllie family at Tower House in Old Portsmouth for 10 years, so was one of the last family members to know him intimately who could recall his methods of working and the details of his fascinating life. W.L. Wyllie R.A., A Reminiscence. The late Sir Hugh Casson, Past President of the Royal Academy. Originally produced by Nigel Grundy in 1988 and released on the VHS format, this programme has been unavailable for many years, but has now been re-issued on the DVD format. Novelist John Wyllie, grandson of the famous British Marine Artist, talks about Wyllie's life and work and presents over 125 of his grandfather's oils, engravings, watercolours and etchings. 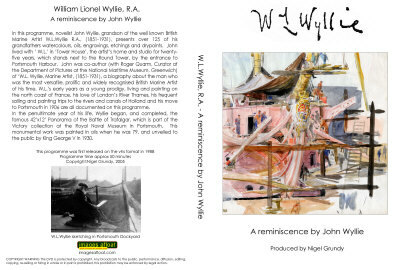 Wyllie's early years as a young prodigy, living and painting on the north coast of France, his love of London's River Thames, his frequent sailing and painting trips to the rivers and canals of Holland and his move to Portsmouth in 1906, are all well documented on this DVD. In the penultimate year of his life, he began and completed the famous 42' x 12' Panorama of the Battle of Trafalgar, which is part of the Victory collection at the National Museum of the Royal Navy in Portsmouth. This monumental work was painted in oils when he was 79 years old, and unveiled to the public by King George V in 1930. Aileen Wyllie in conversation with Diana Villar. The 25 minute audio interview on this CD was recorded in 1978 by the historian Diana Villar during the course of her work with the Portsmouth Area Talking News. During their conversation, the late Aileen Wyllie, daughter of the famous Marine Artist, talked about her father's early years as a young prodigy spent between London and France, his life and work and the painting of the famous 42' x 12' 'Panorama of the Battle of Trafalgar,' now on display at the National Museum of the Royal Navy at Portsmouth Dockyard.